The following morning, instead of riding a bus for our return trip to Shanghai, hb and I decided to take the CRH (China Railway High-speed) bullet train or also known as D Train. 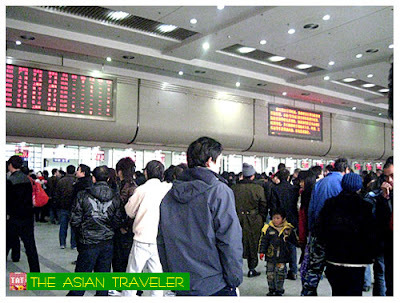 Upon arrival at the Hangzhou Railway Station, the place was jammed and several hundreds of people piled up outside the entrance. 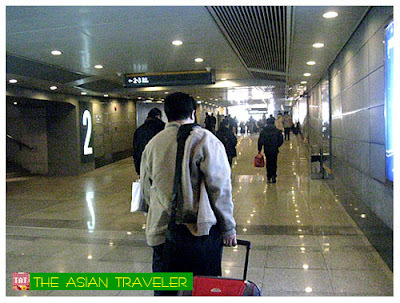 Ignoring the chaotic scene, we dragged our luggage off the taxi cab and directly went to look for the ticketing hall. 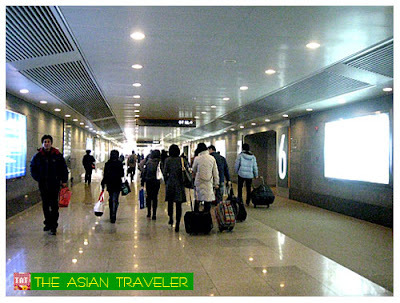 Upon entering, I found myself stunned, glancing around the large room crammed with commuters mostly locals. One security guard was still trying to keep everyone away from blocking the entrance / exit door. The ticketing hall has several numbers of ticket windows with super long queues. It has numerous digital signage displayed on the wall but in Chinese characters. I paused a second, thinking how this can be troublesome for foreigners including me who neither read nor speak Mandarin. 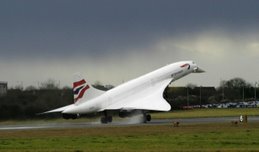 In any case, one solution is you can ask for the ticket booking service ahead of time at any star rated hotel you're staying or travel agencies. As for us, we already bought our Hangzhou-Shanghai tickets in advance, which cost us around 65 Yuan per person. We went to the ticketing hall to purchase for our Shanghai-Nanjing round trip ticket. We got the first class ticket which is called "Soft Seat" with the price slightly higher compared to the second class, which is the "Hard Seat". The ticket number of this starts with a capital letter "D". Entering the air-conditioned departure hall, we needed to pass a security check and put our luggage through an X-ray machine. Inside the lobby, there was a large display screen with scrolling Chinese text. The announcements were also broadcast in Mandarin. Good thing, hb can read and understand a bit of Mandarin dialect, which is plus for us. After a few hours of waiting, we got on the train and found the soft seat section. It was clean and not too crowded. Basically, it's a four-seat in a row (2 seats on each side of the aisle) with the same direction and luggage rack overhead. We looked for our assigned seating and I was surprised to see the huge chairs, which are generally reclining seats with foot and leg rest, comfortable cushions, ample leg room, a food tray which can also be used as a writing desk attached on the arm rest, and a drape for the wide window. 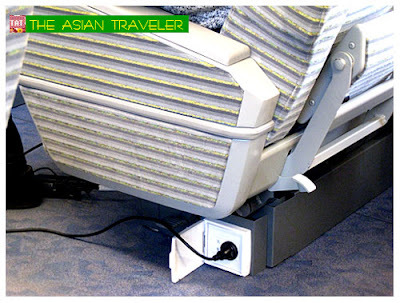 The seats are very similar to business class on airplanes. 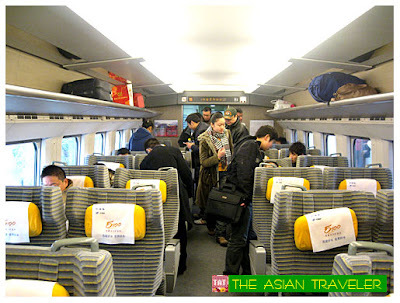 We then put our luggage on the overhead luggage racks and I headed off to the restroom to freshen up. To my amazement, the D Train has Western-style toilets with lavatory that can be found at both ends of the carriage. It's roomy and pretty hygienic. But it's better to carry small packets of tissue as there's no toilet paper available. As we sat comfortably, from time to time a food trolley wheeled back and forth with sandwiches snacks and beverages for sale on board. While spending my time observing, I also managed to see one of the seats with an electrical outlet. 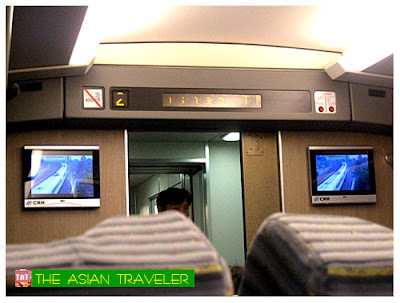 There is also a digital display board providing accurate and valuable data to all passengers about the train speed fluctuation (average speed is about 150km/h and top speed is 252 km/h), arrival time and the weather conditions written in English and Chinese. Compared to the 3-hour bus travel, the bullet train was much faster (around 1 hour and 18 minutes only), very comfortable and we reached our destination on time. The D Train definitely will save time. It's also a great way to see the landscape and scenery along the way. Please keep in mind that you will need to show your ticket upon leaving the station. 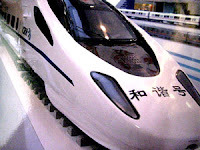 For your information, the trains in China are categorized and named according to their speed and comfort. 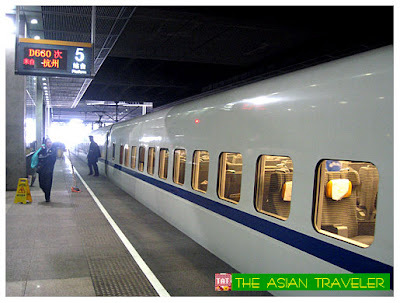 There are 5 different types such as the D Bullet Train, Z Express Train, T Super Fast train, K Fast train and ordinary train. Ah memories, makes me want to ride this train again. Nice post. 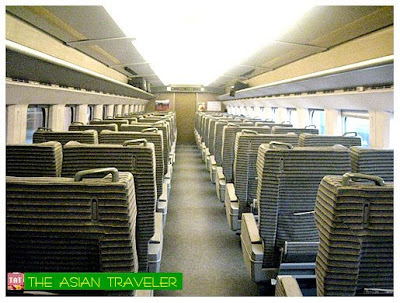 Learn a lot about China's Train Service. 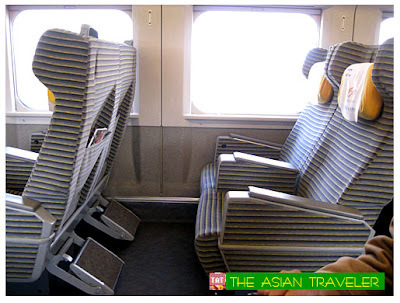 The First Class on the bullet train looks really luxurious. I hope Philippines will have a nice and amazing train like that in the near future. I WISH I CAN ALSO RIDE A HIGH-SPEED BULLET TRAIN. Nicely detailed post from train terminal to couch even the rest rooms. The train surely looks comfortable! Great travel tip of purchasing the tickets in advance. What a comfortable ride on one of the fastest bullet train in the world. 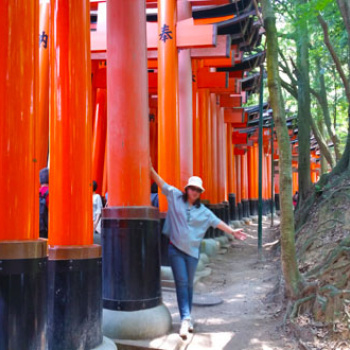 A traveling guide for tourist vacation and destinations around the world.